Many people love electric toothbrushes. They are easy to use and leave your mouth feeling extra clean. One that’s a favorite with many dentists is the Sonicare toothbrush. It breaks up the plaque with sonic vibrations, and is quite effective. Before the Sonicare came along, dentists were generally a bit cool toward electric toothbrushes. However, studies were done that showed that Sonicare, with its sonic vibrations, removed more plaque than manual brushes. Since then, other companies have developed excellent brushes, and dentists have come to recommend them to their patients. Recent testing seems to indicate that the Braun Oral B ProfessionalCare 7000 series also cleans more effectively than manual techniques. Other Braun Oral B models are also effective. We hesitate to suggest that there is any substitute for flossing. There is no adequate substitute for getting floss between your teeth. Nothing else will clean the critical contact point between the teeth and the very important sulcus between your tooth and the gum. 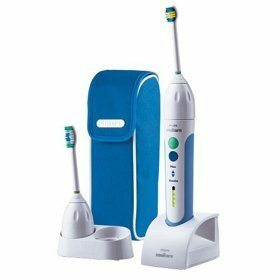 But, for someone who absolutely refuses to floss, using an excellent electric unit such as the brands we recommend here appears to be the best alternative to doing the real thing. Should you use one of these on cosmetic dental work? No problem at all, says Dr. Hall. As long as the bristles are soft, one of these models could work very well for helping to maintain cosmetic dental work. We do recommend using a gentle toothpaste such as Supersmile whitening toothpaste, though. An abrasive toothpaste could damage cosmetic bonding. 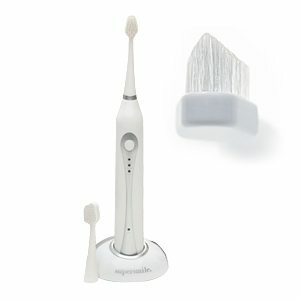 Another option is the Supersmile Advanced Sonic Pulse toothbrush, pictured at the left. Supersmile toothpaste was developed by cosmetic dentist Dr. Irwin Smigel for people with cosmetic dental work. It has an enzymatic action that gently removes the protein pellicle that tooth stains attach to without harsh abrasives. 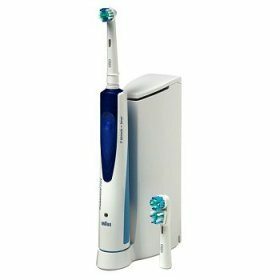 The Sonic Pulse toothbrush has a patented Sonic Technology that operates at approximately 30,000 strokes per minute to help remove plaque and bacteria from the gum crevice as well as polishing and whitening the tooth enamel. The bristles are beveled to a 45° angle for optimum access to be able to clean the gingival crevice. Read about the best ways to prevent tooth decay. Many people have serious misconceptions about this, and this is a case where ignorance can really cost you. People don’t tend to appreciate the seriousness of gum disease until it’s too late.